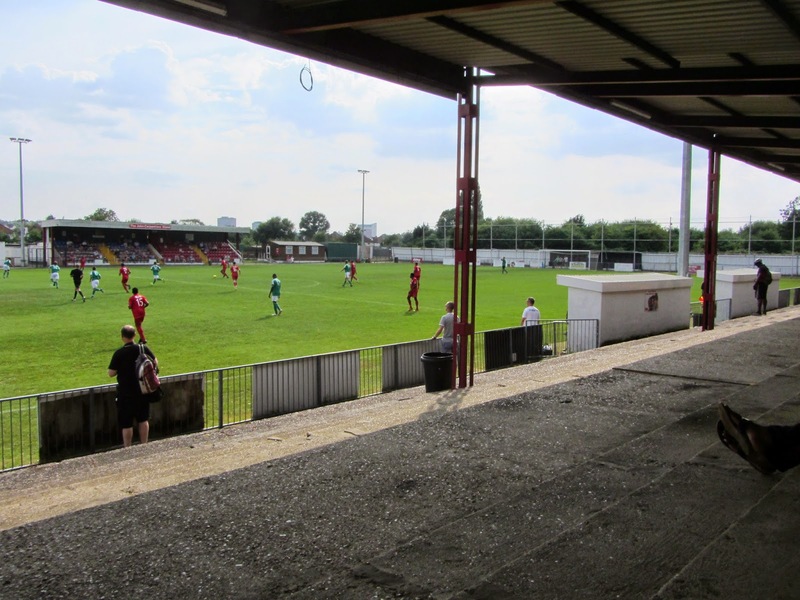 My twelfth stadium of 2014 was on Saturday 26th July at Colston Avenue in Carshalton, London. 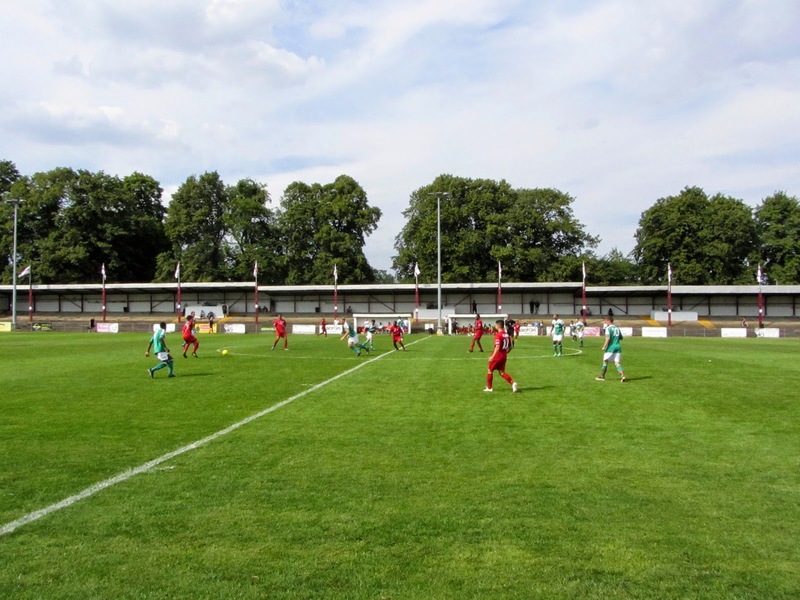 The match was Carshalton Athletic vs. Leatherhead in a friendly. Colston Avenue, also known as the War Memorial Sports Ground, is part of a green space in the middle of a built-up area. The ground is bordered by a mixture of trees, allotments and parkland on three sides with a secondary school on the other. 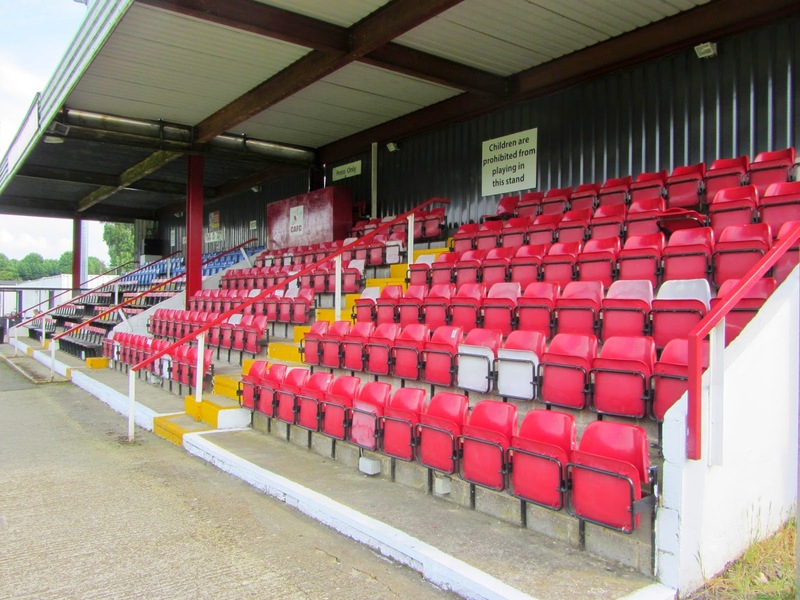 The stadium is just a third of mile from Carshalton railway station and has been the home of the club since 1921. The single all-seater stand is located on the southern side of the ground. This stand, which can hold 240 fans starts from the half-way line and extends towards the western side of the stadium. Attached on the eastern side of the structure is the walkway leading back to the player dressing rooms and further towards the eastern end of the ground there is a clubhouse and food outlet. The northern side of Colston Avenue consists of a covered concrete terrace which extends the whole lenth of the pitch. There is plenty of space for fans here with the roof providing protection from the elements. The two dugouts are positioned directly in front of this stand. The eastern end of the stadium also consists of covered concrete terracing although it is much smaller than the area on the northern side. The western end is mostly uncovered standing though there is a small covered section directly behind the goal. 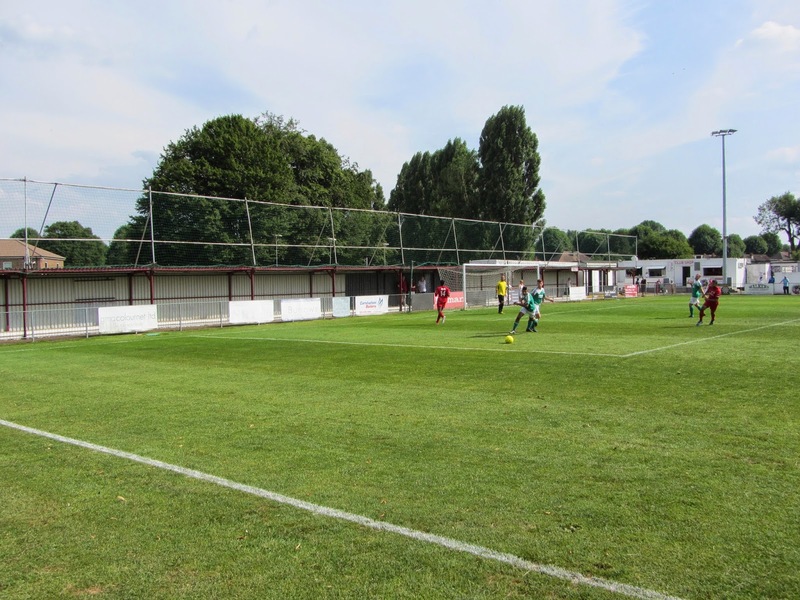 The game was a friendly match between Isthmian League Division One South side Carshalton Athletic and Isthmian League Premier Division side Leatherhead. The hosts almost took the lead in the 28th minute when Nassim Dukali dispossessed a Leatherhead defender and struck the ball towards goal from 20 yards. With the keeper beaten the ball came back off the post and away. Just a couple of minutes later it was the turn of the visitors to hit the woodwork when a corner was swung in to the back post and looked to be going in. Carshalton defender Ricardo Panto reacted quickly to head the ball off his own crossbar and it was scrambled away. In the 43rd minutes Leatherhead did grab the lead as Kiernan Mason-Hughes drew the home defence out with a positive run and when the ball found Ashley Miller he was able to clip the ball into the bottom corner. The away side continued their play into the second period and should have stretched their lead on a couple of occasions. In the 79th minute they were punished when Jason Henry ran down the wing before laying the ball off to Kingsley Aikhionbare to slot home to make it 1-1. In the final two minutes both sides had excellent chances to win the game - first Mason-Hughes split the defence to go clean through but was denied by a good save by Jack Eden. Just after this Jason Henry then found himself one-on-one with the Leatherhead keeper but his weak shot was easily stopped as the referee blew the final whistle.